A Miracle of Science: I believe the children are our future, unless we stop them now! I've designed Mars such that a government is unnecessary. I did this by applying the legerdemain of advanced technology which does not currently exist, a trick relied upon by many fine science fiction authors - and by hacks like me. Of course, the rest of the nations in MoS would require governments because they don't have group intellects running them. Governments don't like dealing with disorganized, amorphous groups of people, so Mars was required to create a government before it joined the Solar Parliament. This leads me to my next thought. The character design which Mark sent me for President Waters had a medal at her collar. Because Mars doesn't need a president, and also doesn't need to give out medals, this item is an interesting bit of frippery. The president's outfit would be designed by Mars for maximum effect, making Mrs. Waters look as presidential as possible. I can imagine the Martians starting with a comic-opera dictator's uniform and whittling it down to this one, tasteful bauble. And it's all thanks to Mark's design. I'd like to say I went through such a careful thought process as Jon just described, but in reality I just thought that medal the Governor-General of Canada wears is kind of neat. (I do recommend that site, by the way -- J. J. McCullough is a gifted caricaturist.) If you're curious, I uploaded President Louise Waters's character design here; as usual, my vague design sketches look substantially better than the polished final results. As well, before her character was firmly nailed down I designed a male President of Mars. I've uploaded that sketch as well. 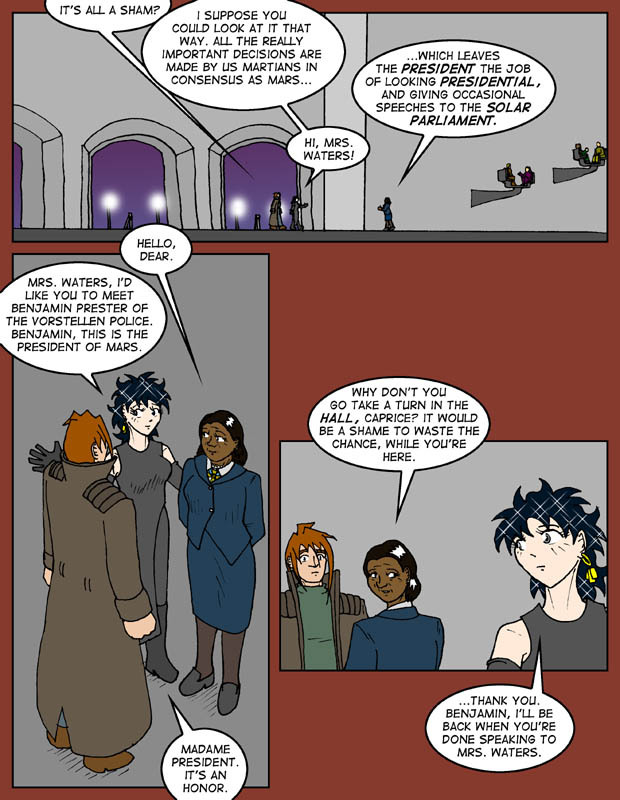 Today's recommended comic is Saturnalia. I can't imagine why I avoided this title for so long -- I think I had it confused with some other webcomic. Anyway, it has slick art (I only wish the panels were bigger so I could better appreciate it!) and a fun futuristic setting, and is pervaded by the general sense that its creator is really enjoying making it. So, you know, check it out why don'tcha.